It is with great sadness and heavy hearts that we must announce that our founding Master Director, Jenny Lawson, died after a long illness on Saturday 6th April 2019. Jenny was extremely grateful to the local NHS staff and services who provided her with treatment and care over recent years. 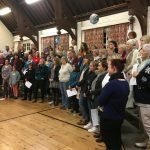 As many will know, Jenny founded Surrey Harmony in 1990 and chartered the chorus with Sweet Adelines International (SAI) in 1992. 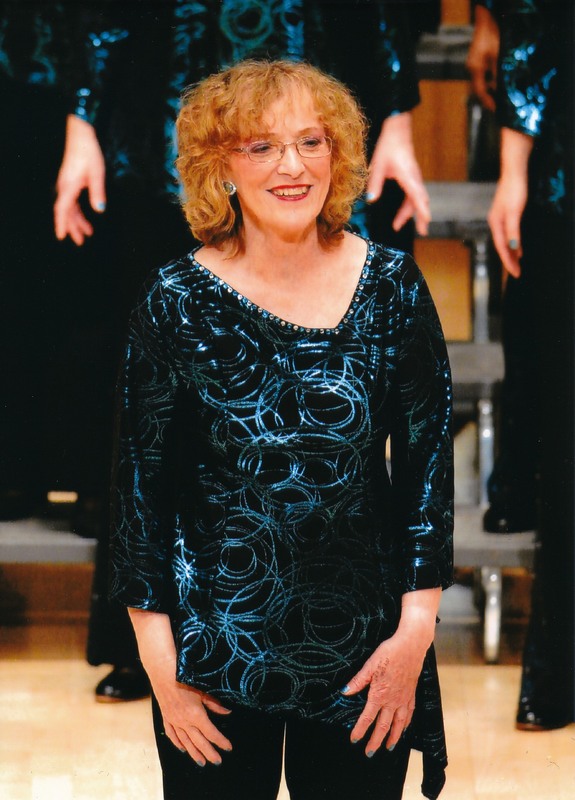 She was responsible for leading and directing the chorus to many successes over the years, including five regional gold medals, seven regional silver medals, two wildcards, and seven international appearances. Competing at international was a huge challenge for Jenny as she had to overcome a very strong fear of flying, but her love of singing and drive to succeed enabled her to overcome her fears. Also having her Assistant Director and friend, Judith, alongside for support made all the difference. At the 2009 international competition, she directed the chorus to the highest place achieved by a UK chorus until very recently, 15th in the World. She was responsible for growing the chorus from its small start with just 14 singers, to over 80 members. She was also a member of a number of quartets, with Zig-Zag achieving the most notable success with a bronze medal at regional convention and a gold medal at Sligo Music Festival. Jenny had a natural talent and a fantastic musical ear which led her to strive for accuracy and excellence for her happy group of singers. As Director, she brought her natural comedic wit to rehearsals every week, often having the chorus in fits of laughter. Her legacy of developing excellent singers has spread from Surrey Harmony, with ex-members now running or being part of many other well-respected and successful barbershop choruses like London City Singers, Vocal Dimension Chorus, Viva Acappella, Forth Valley Chorus, Spinnaker, Plymouth Mayflowers, Sound of Alaska, Hobart Harmony, Faultline chorus and A Cappella West chorus. Jenny pioneered women’s barbershop for mainstream media through Surrey Harmony’s involvement in Sainsbury’s Choir of the Year and a televised concert at St James’ Palace. She was a gifted arranger and her home region, Region 31, continues to this day to sing the anthem Quartet of Nations, which she wrote and arranged. Despite her many talents, Jenny was a shy and private person, who avoided the limelight and disliked direct attention or plaudits. In 2017, SAI presented Jenny, in absentia, with the Ann Gooch Award. This Award recognises recipients who, through their talent and dedication, have significantly contributed to, and been a driving force in the development and growth of, Sweet Adelines and women’s barbershop singing beyond the borders of North America. The Award derives from the passion and work of Ann Gooch, a past president and Board Member of Sweet Adelines. The award in 2017 recognised Jenny’s outstanding contributions to Sweet Adelines International and Region 31 over many years. She will be remembered in so many wonderful ways by family and friends, all those who had the pleasure to sing with her, be directed or coached by her, and by those who knew her through the barbershop community. Jenny’s family would like to invite anyone who knew Jenny – from near and far – to attend her funeral and celebration of her life. The funeral will be held on Tuesday 23rd April at 2.40pm at North East Surrey Crematorium, Lower Morden Lane, Morden SM4 4NU, followed by a celebration of her life at a nearby venue. Please confirm your attendance to info@surreyharmony.com so that we can let Jenny’s family know how many people are planning to attend. In celebrating Jenny’s life, Jenny’s family have requested that any donations in her memory should go to Marie Curie Cancer Care and St Raphael’s Hospice, Sutton. In order to provide a simple link for this, Surrey Harmony has set up a Just Giving page, where you will have the choice to donate to either charity, or to split your donation between both. BarbershopFootball – is that a thing?